I get to know about this hotel, resort, casino from Kennysia. Thanks to him, I only get a chance to visit this hotel. Not only visit, but also stayed a night at there. 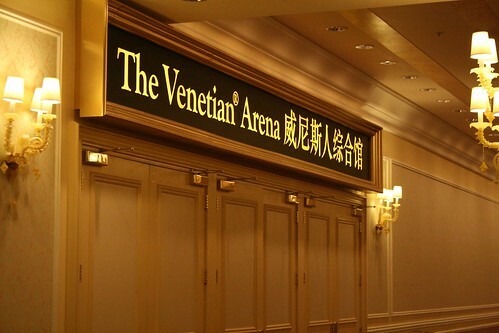 It’s The Venetian Macau. I guess you guys heard about it too. It’s new, grand opened last year sometime in September, I’ve forgotten the exact date. You can look up at Kennysia’s archive. On a very fine day during my Hong Kong trip 10 weeks ago, me, mom and dad went to Sheung Wan and took the speed boat or ferry or whatever to Macau. The whole journey took about 50 minutes to arrived at Macau. I took a nap on board. Arrived straight at the terminal of the same island where The Venetian Macau is on. Macau is actually divided into 2 island, 1 is the main city and the other where the Cotai Strip. After passing the immigration custom, we took the free shuttle to the hotel. It’s only takes 5 minutes to reach the hotel from the Taipa Temporary Terminal. Surprisingly, the bus didn’t drop us at the main lobby but at the other end of the hotel where the West Lobby is. It takes a while queuing up for check-in. I saw a lot of Chinese there, really lot and a little of western travellers. I guess Chinese has too much of money and time in hand, but seriously they do. After getting our room keycard, we went our suite right away. There’s even a map given. The resort is big, huge, elders or youngs might get lost. Let’s say you are stay near the North suites area, you might walk to the other end and go South suites area. Nevertheless, it’s connected everywhere, but inaccessible somewhere where the casino is, just that you need to walk a longer distance. From the lobby to the suites takes a while too. Passing cafes, restaurant, shops, walkway, and the 15000 seats capable Venetian Arena or stadium. There’s actually a short cut, but I am the kid with my mom and dad and kid doesn’t allow to pass through casino, so we have to walk around the casino to reach the suites. Casino doesn’t seems very crowded with people. It’s not so happening as I could felt that. For security purpose, preventing stranger going up to the room. There’s a security guard standing post at every suites lift area. You will need to flash your room card key to him only then he allow you take the lift. Not bad. During the onling reservation, I request for a room at a higher level and so we got a room at th 30th floor. So high! I just love the room, no it’s suite! It’s the cheapest of all suite, around RM790 per night. There’s 2 big bed, 2 TVs, many pillows and best of all is with free high speed wireless connection in the room. Yay, I got to go online there easily instead of looking high and low for open network in Hong Kong. This was my first time staying at a so expensive hotel, but I must say that this is a must do once in a life time. I got to stay 1 night there was enough for me, I am very happy already. There’s even a printer provided for work purpose, but I got nothing to bring. If Malaysian goes there, I believe they will play with the printer, print something out even got nothing to print. Talking about me? I made a photostat of something and threw it away. HAHA. Another view of the room. Spacious. p/s:I booked the room via AsiaRooms.com, it’s cheaper from booking through the main site. OMG. You actually stayed a night there! Envy sial. Eh, I mean, I would spend the money on something else lar rather than paying RM790 just to sleep. Haha. Can we just go there in Venetian Macau without checking in? Can we just go there and take pictures?